It’s football season, and this Cranberry Cheese Ball would make a perfect halftime snack! This recipe is easy to make, easy to transport to your next party, and a guaranteed crowd pleaser. You can even make a Cranberry Cheese Ball ahead of time. This will keep in your refrigerator for several days. Alternatively, you can freeze it for several weeks. It will thaw nicely if left in the fridge for 24 hours. Combine all ingredients except chopped nuts; mix well. Shape into a ball (or a log shape, if you prefer). Roll in chopped nuts. 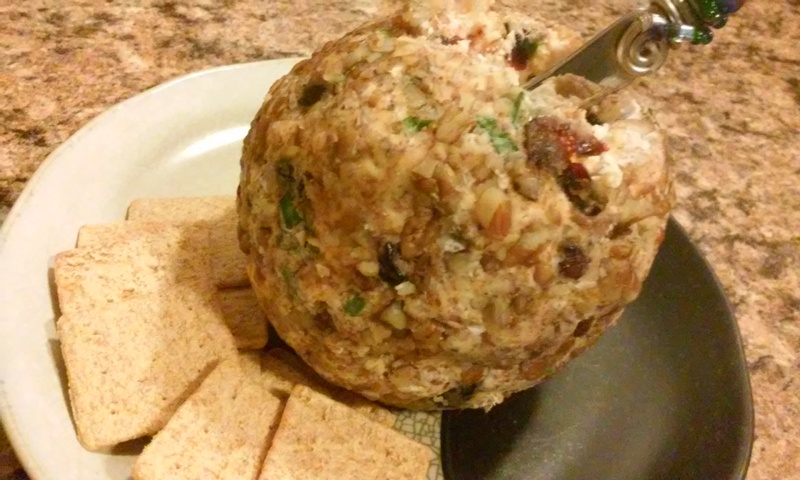 Wrap Cranberry Cheese Ball in plastic wrap and refrigerate until serving. To serve, allow Cranberry Cheese Ball to come to room temperature. Serve on a platter surrounded by crackers. This entry was posted in appetizers and tagged appetizers, children, Cooking, Family, Final Four, Food, football, March Madness, party, Recipes, sports, Superbowl, teenagers. Bookmark the permalink. We made this, and it was delicious. Believe it or not, we enjoyed it on toast the next morning, after our party. I will be making it specifically as a toast topping next time my dad is over to visit! I wouldn’t have thought to put it on toast as a leftover – that sounds fabulous!